Coupons | All Tune Complete Auto Repair. Includes disk brake pad replacement. Some high profile vehicles and drum brake extra. Semi-metallic and ceramic brake pads add’l. *Most models. Includes up to one pound of freon. Dex-cool coolant additional. Includes up to 5 quarts motor oil, oil filter, and chassis lubrication. Some high profile vehicles extra. Includes computer diagnostic and spark plug replacement. Call for details. 6+ cylinders and platinum spark plugs add’l. Must present coupon at time of sale. 4WD and SUVs add’l. Replacement or overhaul. Some standard transmissions excluded. Must present coupon at time of sale. Must present coupon at time of sale. Oil change, radiator drain and fill, tire rotation. *Most vehicles. Dex-Cool coolant add’l. From transmission replacement to oil changes, we do it all. 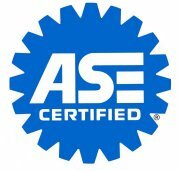 Certified by the ASE, our mechanics are recognized for their skill and proficiency. Start saving money by taking advantage of our online specials today!